While every beginning woodworker focuses his/her budget on the woodworking tools necessary to outfit the shop, there are a number of shop accessories that are not only useful but in some cases, absolutely necessary. 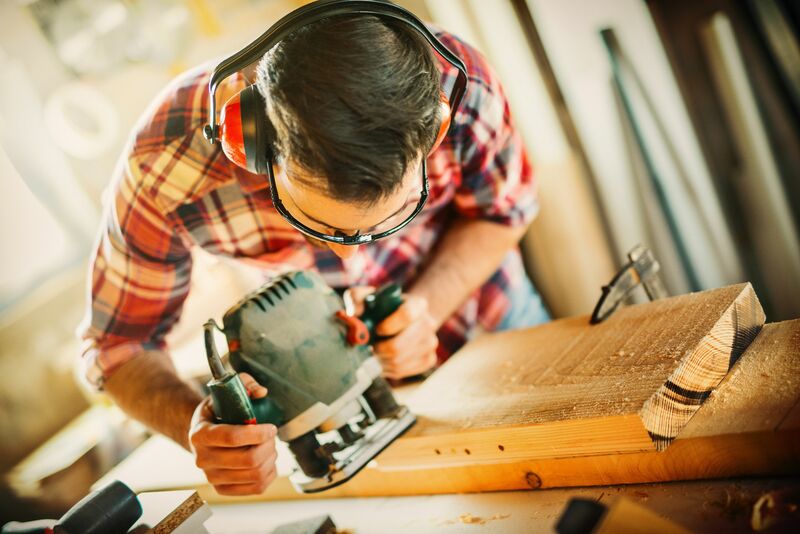 In this article, learn about the top shop accessories for every wood shop. As you'll see, some of these are items you can build yourself, while others are tools that aren't always associated with woodworking, but useful in the wood shop nonetheless. Probably the handiest shop accessory in this list would be the woodworker's bench, complete with a vise. The bench is a stable-based table with a thick, hardwood top. In the top are a series of holes that are designed to accommodate bench dogs, which are little more than pegs that can be moved from hole to hole as necessary. The end of the bench has the aforementioned vise that works in concert with the bench dogs to hold pieces steady for the woodworker. Probably the next most useful shop accessory is a large work table. I like to use a portable table that can be moved around the shop as needed. This particular table, which you can build by clicking on the link above, is lightweight yet sturdy and has retractable casters. When you want to move the table, simply lift each end and the casters lock into place to allow the table to roll. Once you get it into position, pull the cord on each end and the casters retract, so the table won't move. Every carpenter or woodworker has needed a pair of sawhorses at some point. I've used them for hundreds of tasks, including as a sturdy base for a table saw. This set of saw horses is stackable, very solid (they will hold as much as 500 pounds each if properly built) and very easy and inexpensive to build. Once you have a set, you'll find hundreds of uses for them, not only in the wood shop but around the house as well. Once you've begun to collect a number of both hand and power tools, you'll need a place to store them when they're not in use. Whether you decide to build a cabinet with cupboards and drawers or just a shelving system to store them out of the way, you'll need to develop a system that works for your shop layout. If a dog is man's best friend, clamps are a woodworker's best friend. Clamps (bar, pipe, vise, etc.) aren't necessarily cheap (as much as $50 each), but if there's one axiom of woodworking, it's that you can NEVER have enough clamps. Try to add a couple to your stable regularly whenever you can afford it. A simple clamp storage solution is a 2x4 mounted horizontally high on a shop wall. Rest one end of each clamp on the board, and the other end dangles beneath, resting against the wall. To keep your shop clean, invest in a large, well-built shop vacuum. Most machines and some power tools have ports for connecting a vacuum to help control dust in the shop. Additionally, you can use it as a standard wet/dry vacuum. As you progress in accessorizing your shop, you may want to consider a more sophisticated form of dust collection. Some manufacturers offer dust collection systems with ported ducts throughout the shop. These types of systems make breathing in the shop much easier. Few people think of a bench grinder as a woodworking tool. Well, technically, they're correct. However, a bench grinder can be invaluable for a number of tasks, particularly in keeping chisels and other tools sharp. They're inexpensive (ironically, about the same price as a very good clamp) but they're a useful addition to any wood shop. A feather board is designed to hold stock in place against a cutting head, be it a table saw blade or a bit on a router table, as it is fed through the tool. Featherboards are invaluable when performing intricate cuts such as a routing a beaded edge on a board. Featherboards can be purchased commercially, but I've never found a reason to buy them because they can be made so quickly and easily using scrap materials. Jigs are invaluable in the shop, and in most cases, you can create them yourself. Jigs are simply homemade tools to help you cut certain shapes. For instance, a panel cutting jig will ensure that a panel is cut square to the bottom edge of the board. A circle cutting jig will allow you to cut perfect circles out of stock. A ​tapering jig will let you cut tapered legs on a table saw. There are many other jigs you can build, and I'm sure you'll keep each one you make for future use.